Looking at our trusty atlas we both agreed the Ringkobing Fjord seemed unmissable, over 30 km long (but less than 2 metres deep across the whole fjord) with a causeway separating it from the sea. A few miles further on Nissum Fjord, slightly shorter but still only separated from the sea by a sliver of land, so two fjords for the price of one both on what appeared spectacular causeways. We have to be honest and say, it looked better on the map! It is a brilliant road but somewhat wider than we thought. To our left we had a view of the san-dunes to our right if we squinted we could see the fjords. It was worth the effort, plenty of parking spots that allow you to climb over the dunes onto the pure white North Sea sand and possibly some of the best beach houses we have seen from cutesy wooden beach shacks to enormous Saxon houses built around small courtyards. Despite it being the end of June and what we thought would be busy holiday season there was a serious lack of holidaymakers. Those we did see were pretty much all German. Without exaggeration two out of three of every registration plates we saw were (car and motorhome) German. It could have been the gale force winds putting all but the hardy off but we were told that high season starts next week and they are expecting an influx of visitors. We braved the winds for a spell on the beach, spent an hour pebble collecting, had a good sand-blasting then we returned to the van and avoided that side of the dunes for the rest of the day. We broke the causeway driving with a stop in Ringkobing town, parking up on the marina overnight. 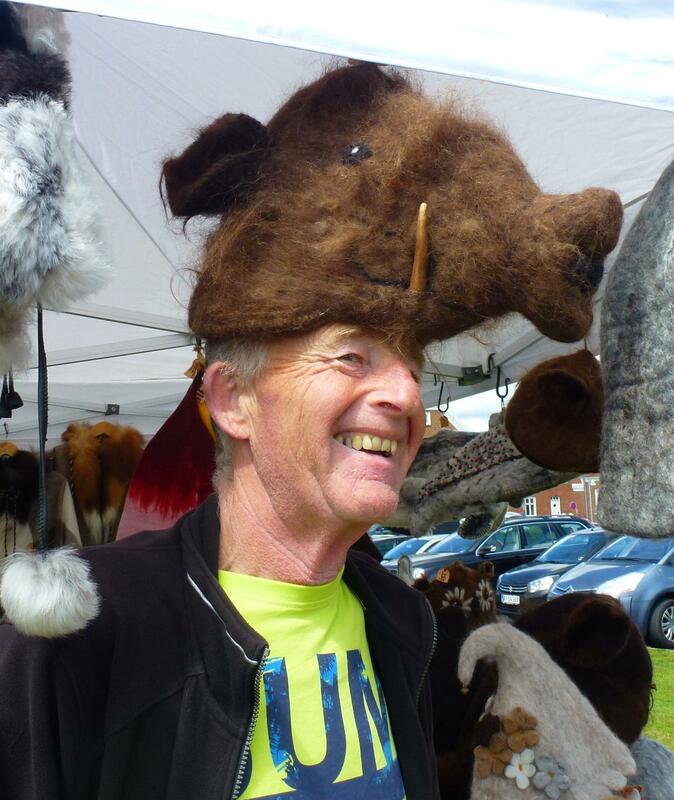 The harbour had one craft stall selling hides and authentic Norse wear to motorhomers and sailors alike – we are proud to say we resisted, even if Iain did look rather fetching in a moose hat. We wandered around town for a few hours, pretty much your average tourist town, lots of cafes, some decent shops and a rather strange church where the tower is wider at the top than at the bottom. We were disappointed not to find Danish Bacon anywhere, we thought Denmark would be rife with bacon butties. Instead the local speciality is called a “sausage wagon”, to us a big hot dog, there are stands in every town and village but humble bacon butty is nowhere to be found. Whilst we continue the hunt for bacon Iain is single handedly maintaining current national production levels of the Danish pastry, consuming them at every opportunity. On the edge of the marina was the “The survival of the fattest” statue, previously displayed in Copenhagen at the 2009 UN Climate Change Conference next to the famous Little Mermaid. 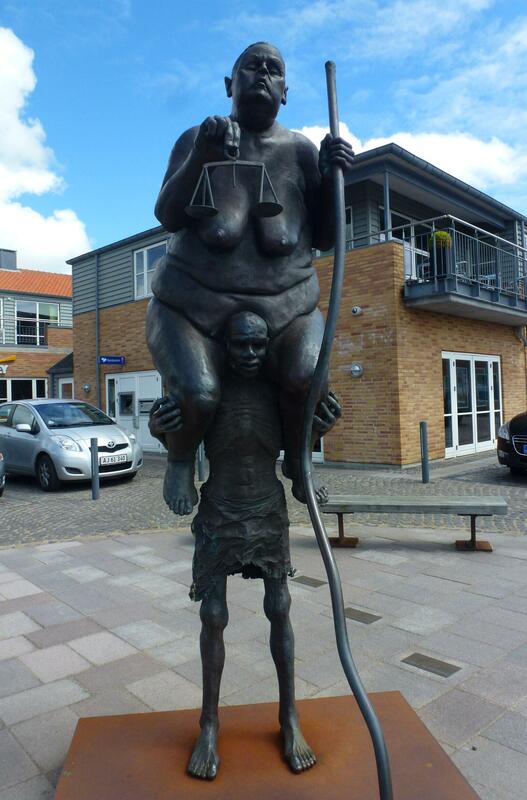 Denoting the fat of the West on the shoulders of the underfed Africa, its new home overlooks a chip shop and ice-cream parlour – unsure if they thought of that when deciding where to place it? 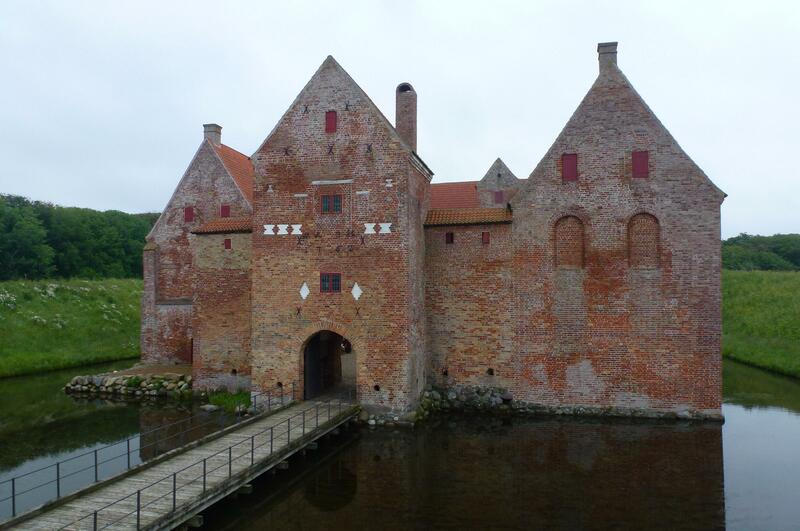 Due to the jaunt up the fjords we ended up further North in Jutland than we planned so we called a halt at Gyldendal. A small marina, a couple of houses and an ice-cream shop was the sum total of the hamlet. Very like being in the Hebrides in terms of scenery and weather (we didn’t have rain we had torrents), our view looked over a misty fjord where the occasional sailing boat past, other than that not a soul around. Behind the marina were wooden structures about 3 ft high, looking a bit like shoe boxes with a gap at the front. These are for people to sleep in, walkers, cyclists etc can just climb in with a sleeping bag and kip out of the elements. Outside each one was a fire pit, bench and water supply – cracking idea for camping on a budget. 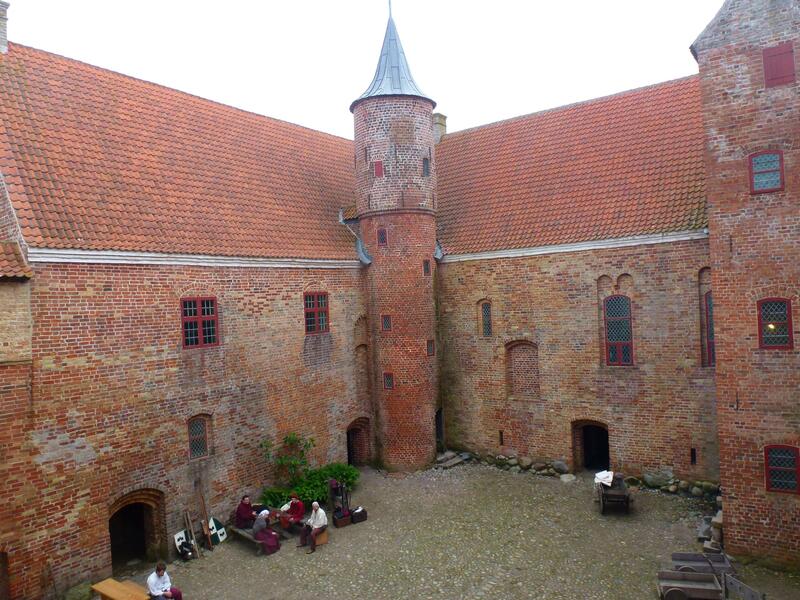 The main tourist attraction in the area was the castle, the best preserved medieval castle in Denmark. Built in 1521, it has not one but two moats, and a lively bunch of volunteers dressed in period costumes and wandering around making coins, baking pancakes, weaving etc. Inside the castle it’s access all areas, from the cellars – where the only lighting is candles burning on tables – right up into the rafters where boarding allows you to walk through the roof spaces. Outside the the herb and rose gardens were beautifully restored to mimic a medicinal medieval garden. Our stay in Germany was brief, we intend to explore more after Scandinavia. Onwards and upwards to Denmark, where we were pretty sure they had converted to the Euro, until we arrived and saw the prices in Kroner. After searching out a bank and drawing out funds we found out most places accept the Euro too, prices nearly everywhere are shown in both currencies. Our first stop was just a few km over the border, Mogeltonder – surely worth visiting just to say the name! A tiny village with just over 800 residents, including one very special one; Prince Joachim of Denmark, the 2nd son of the present Danish monarch, has his private home in the village (sadly he wasn’t home!). 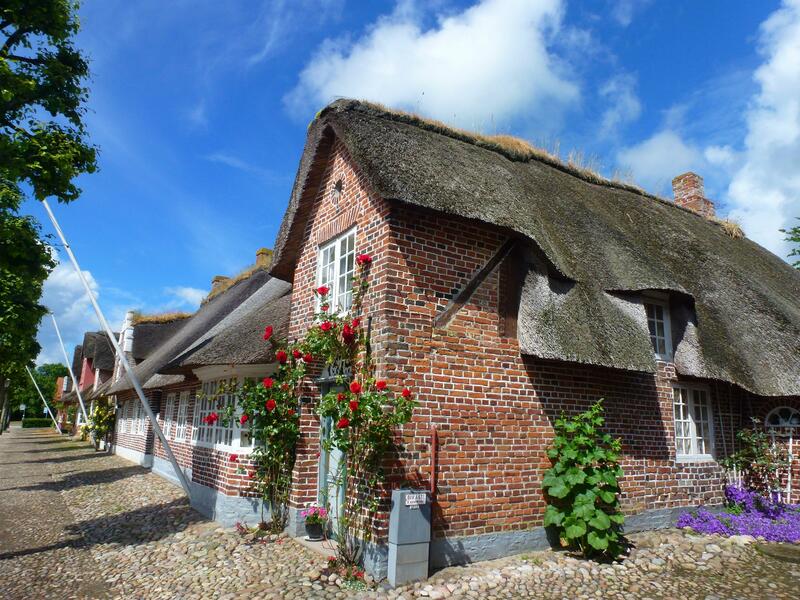 It’s also a popular destination for tourists, “Slotsgaden” (The Castle Street) is the main street and is covered with paving-stones, flanked with lime trees and every house has a thatched roof and roses growing over the doors and walls. Several tea shops and a couple of gift type antique shops, the only thing missing were the tourists – on a sunny Monday morning just us and two Italian motorhomes. The village church was more like a cathedral, one of the biggest churches in Jutland. Elaborately decorated with enclosed wooden pews, painted wooden panels covering the walls and a fresco covering the ceiling. The church has two claims to fame – the oldest church organ in Denmark and that Prince Joachim celebrated his second marriage there a few years ago. 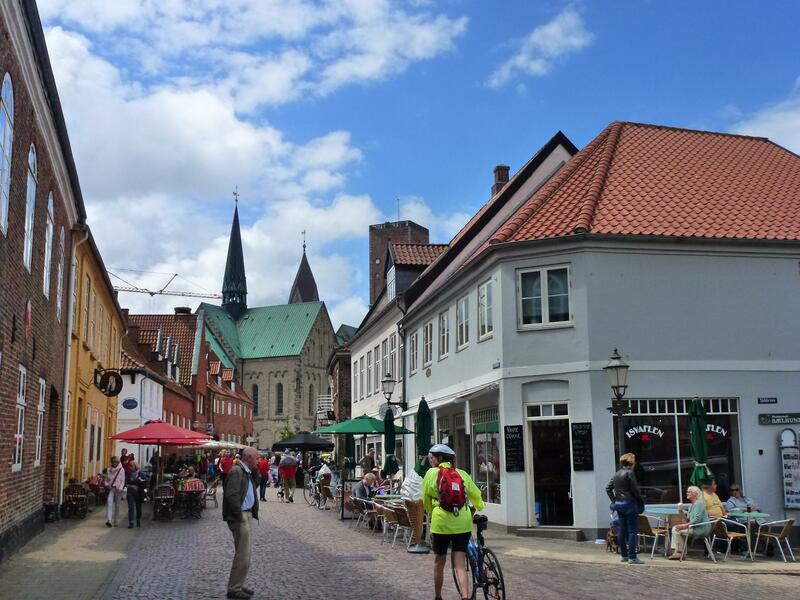 We stopped off for our first few nights at the town of Ribe – where the Danish claims to fame continued to roll out thick and fast. 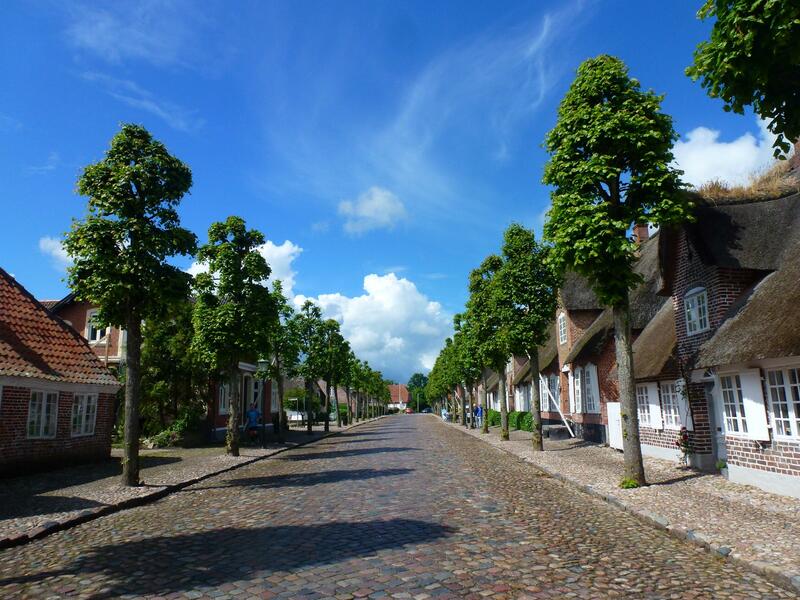 Ribe’s being the oldest town not only in Denmark but in Scandinavia. 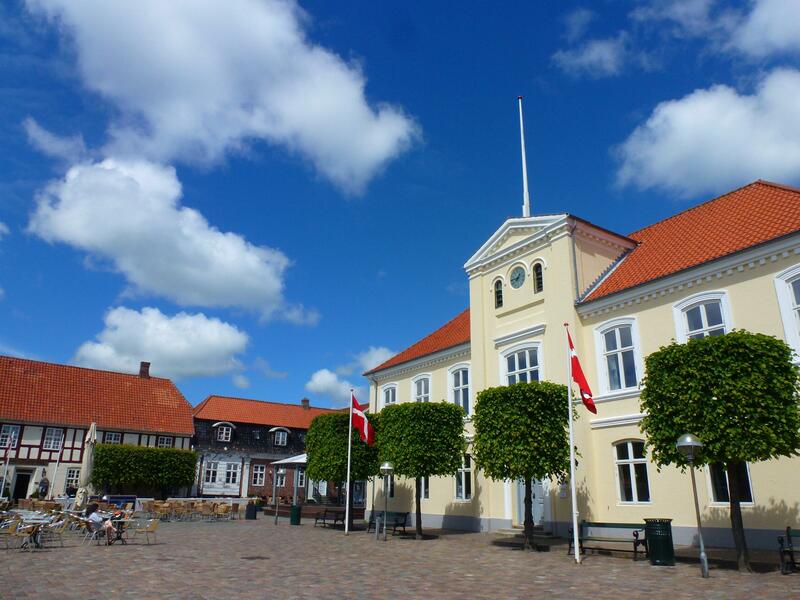 The town hall dates back to 1496 but the town itself was established in the 8th century. More cobbled streets, houses leaning at angles that defy gravity and a vibrant shopping area full of all things Scandinavian – bright, colourful, fun and you never knew you needed it til you saw it – type stuff such as cups with a slot on the side to hold a biscuit, weeny deckchairs that are just big enough to rest your neck on etc etc. Every evening the Night Watchman wanders the town, singing an alert to the residents that its time for bed. This takes place at 8pm then again at 10pm, apparently very popular with the tourists but wouldn’t think its a great deal of fun for the locals. 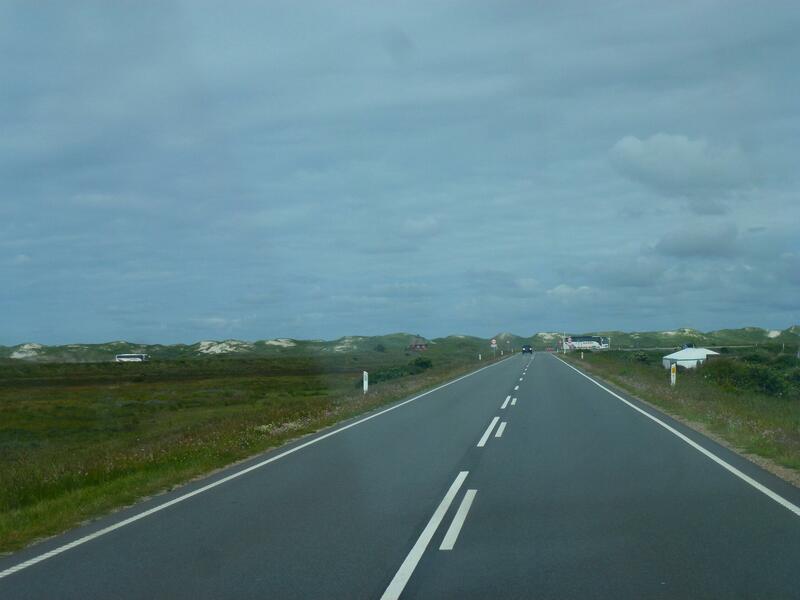 On our second evening at Ribe entertainment was provided by a German in an Arto motorhome, driving on to what was clearly sand – and sinking. The more he tried to get out the deeper he sank, what started as an inch or so was, an hour later over half way up his tyres. Could have cried for them, if it had been us would have cried! Everyone on the campsite knew a better way to get him out, and each way sunk him more. After two hours a small tractor managed to tow him away – we will from now be checking the firmness of all ground before parking, still having palpitations thinking it could have been us! Denmark is all about the islands – Funen in the middle, Zealand next to Sweden and a further 404 of them scattered around the coast. We are currently on Jutland, which is attached to mainland Europe but has a large contingent of islands all the way along its coast. 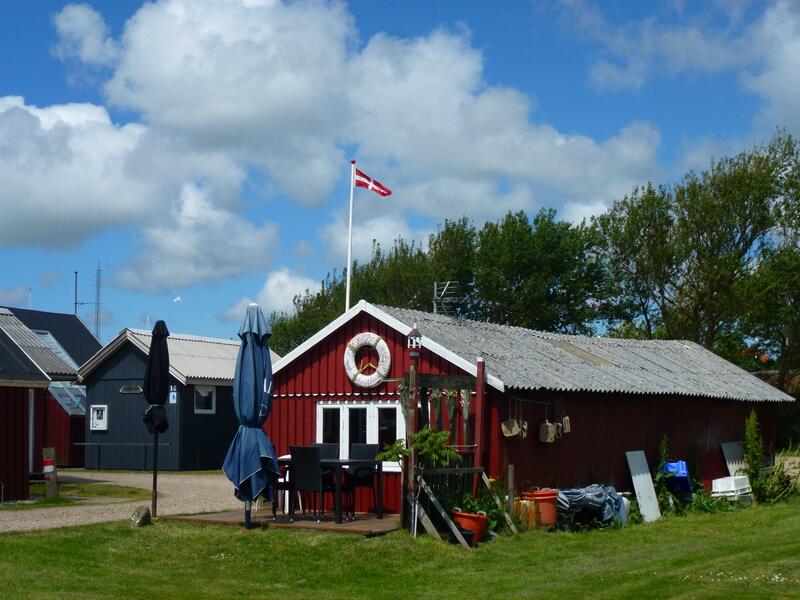 We popped over the 10 km causeway to Romo, claim to fame being the southern most Danish island after the previous holder of that accolade sank in 1999! We high-tailed it out in case history was due to repeat itself anytime soon. Many of the islands have causeways but at Fano they go one better. When the tide prevents driving over the 10 km causeway they operate a sea-tractor bus. Basically a tractor pulling a double decker bus type contraption over its axels in sea water. 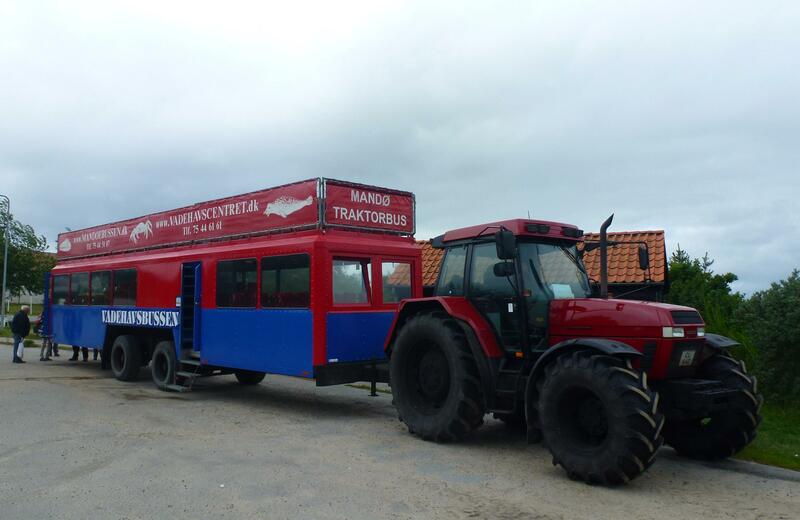 It must be a popular route for tourists, only 40 people live on the island and yet there were five sea-tractors parked up at the boarding point. The top deck is open to the elements, with a gale blowing ice cold winds no-one was hardy enough to sit outside, saying that even on the enclosed lower deck people looked freezing. 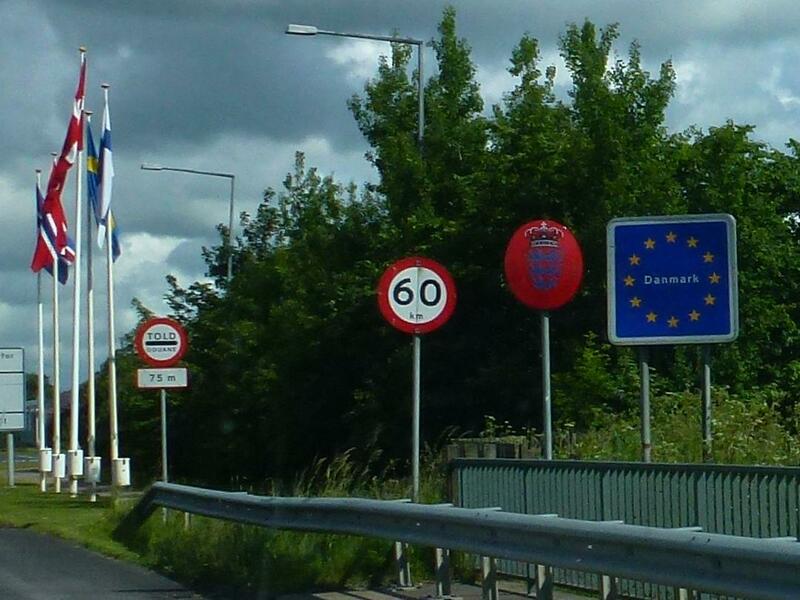 As we drove through Esbjerg it was slightly strange to see a road sign for “England”, we guess its a hangover from the days when a ferry service existed. 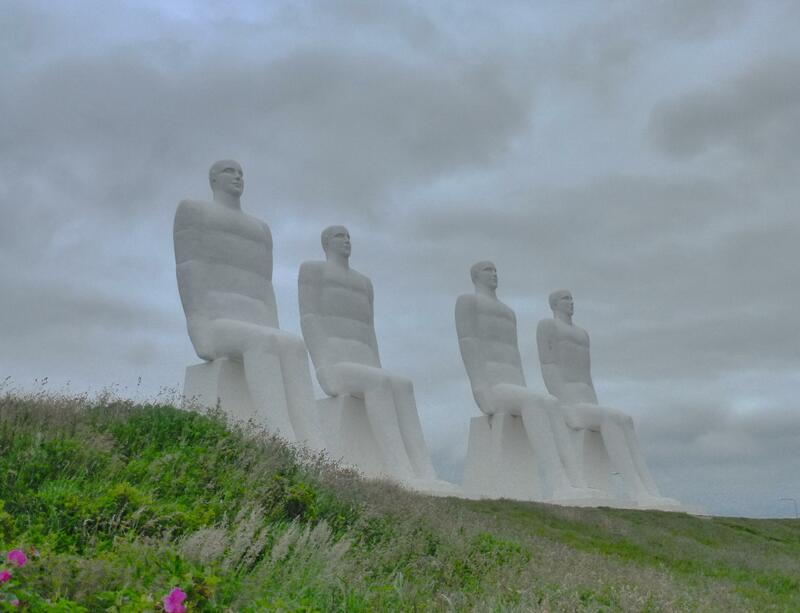 We didn’t linger in the town, instead our aim was to see the “Men at Sea”, a 30 ft (9 metre) high monument consisting of four, white concrete, seated males facing out to sea. We parked up for an hour in the car-park overlooking the statues along with a number of others, only jumping out briefly to take photos during lulls in the storm force winds. Men at Sea – Svend Wiig Hansen. We ambled up the coast searching out somewhere to stay, it seems there are two types of campsite here, the first wants to charge more than the cost of the national debt of a small nation, the second priced in-line with what a sane person might want to pay. We aren’t ones for the bigger sites, we did try one today and the guy just kept adding numbers until a night was over what we want to spend for 3 nights. We drove on and within a few miles came across a small farm cafe with a camping sign,they charged us less than half the price of the first site 🙂 we do love a bargain so pitched up with the ponies for the night :).